A strong storm over the northeastern United States produced widespread IFR conditions over that region. The storm was also accompanied by multiple cloud layers, however, and that made diagnosis of regions low clouds/fog difficult. 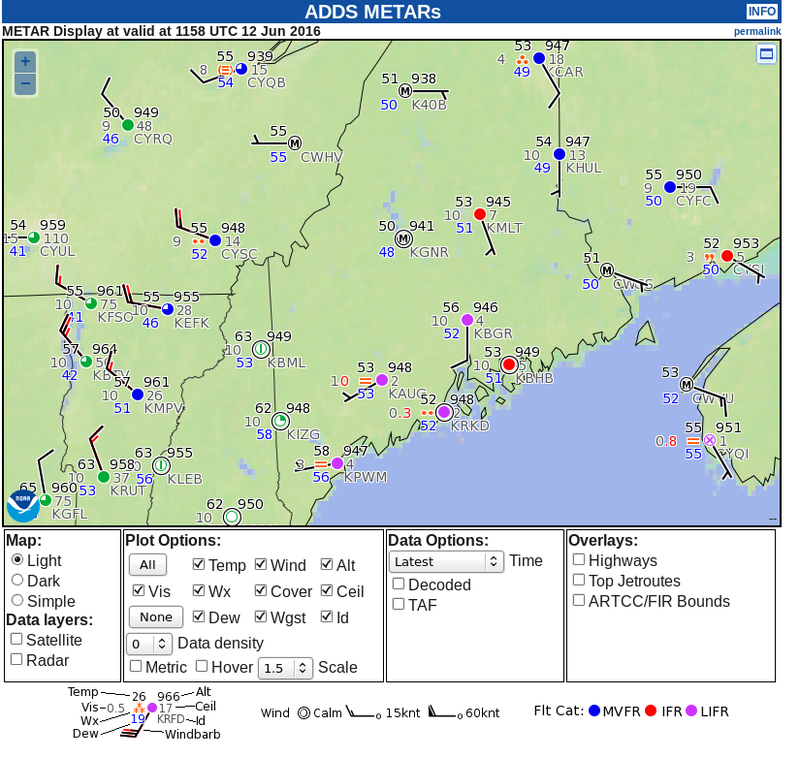 For these cases, a fused data approach is vital — using model information (in the case of IFR Probability, above, the model is the Rapid Refresh) to provide information at low levels allows for a better tool to alert a forecaster to the presence of reduced visibilities. 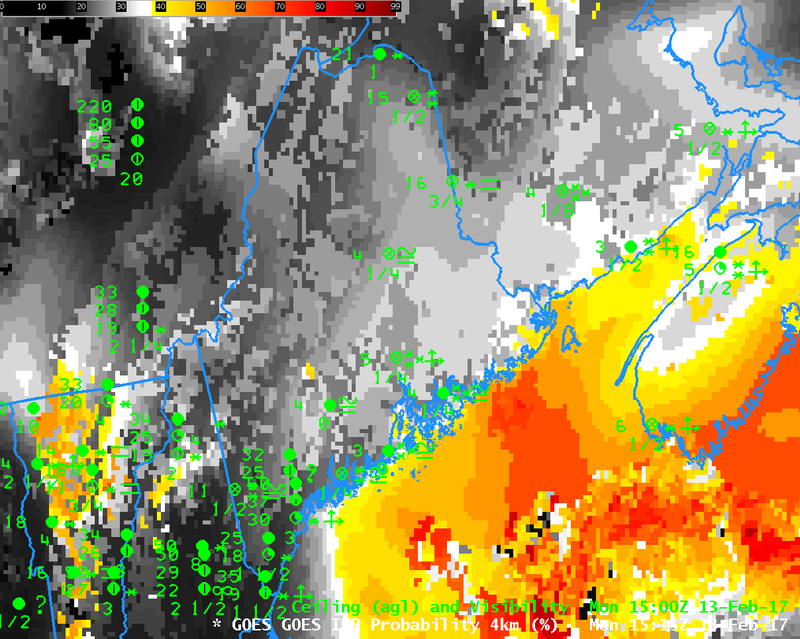 In the animation above, Maine intially shows IFR Probabilities around 50% — but the flat nature of the field should alert a user to the fact that satellite predictors cannot be included in the computation of IFR Probabilities because high clouds are preventing a satellite view of low clouds. Accordingly, the computed Probability is lower. 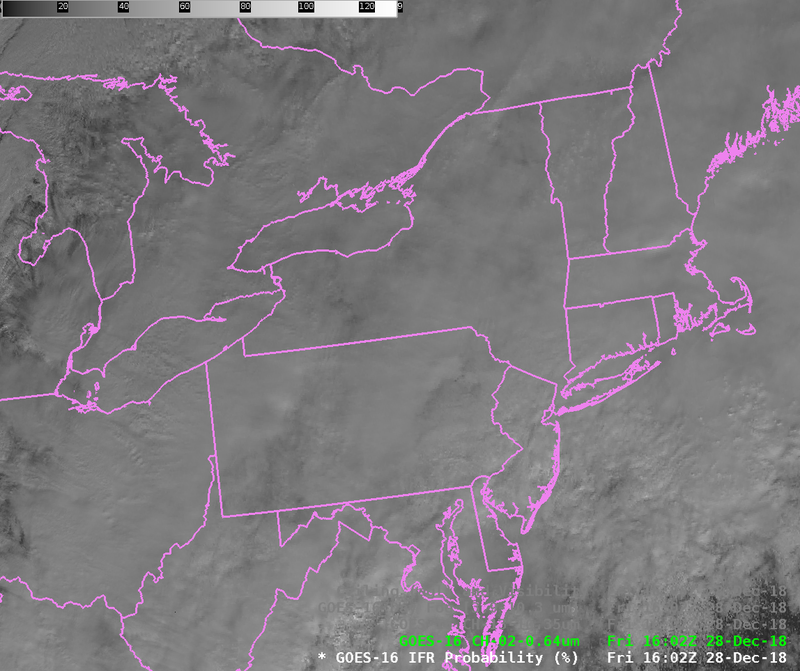 In contrast, high clouds are not present over southern New England at the start of the animation, and IFR Probabilities are much larger there: both satellite and model predictors are used. 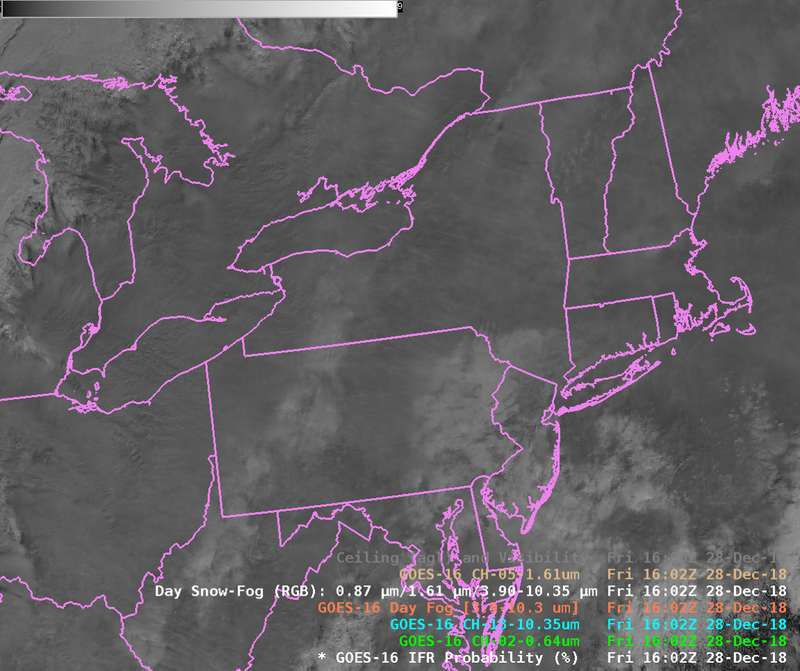 As the high clouds lift north from northern New England the region of higher IFR Probabilities expands from the south. Note the influence of topographic features on the IFR Probability field. The Adirondack Mountains and St. Lawrence Seaway have higher and lower Probabilities, respectively, because of the higher terrain in the Mountains, and the lower terrain along the St. Lawrence. An example of why fused data are important is shown below. Look at the conditions in Charlottetown, on Prince Edward Island, in the far northeast part of the domain. 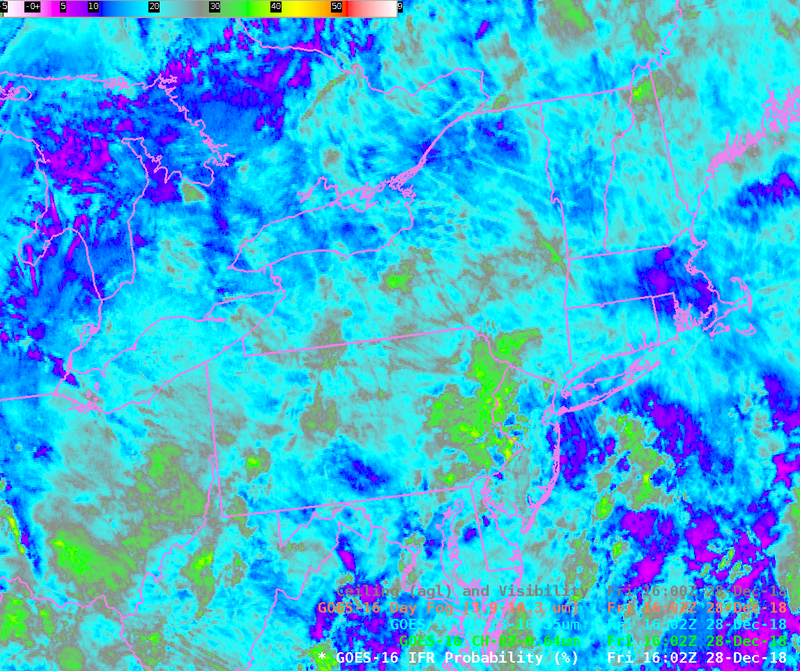 Between 0315 and 0400, ceilings and visibilities deteriorate as IFR Probabilities increase. 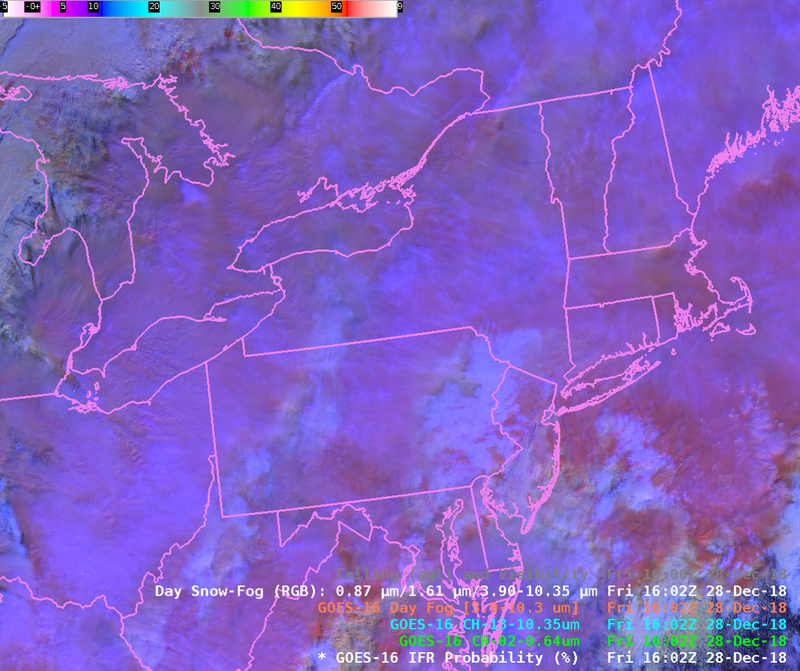 The brightness temperature difference field, at bottom, shows no distinct difference between those two times because the clouds being viewed are high clouds. This entry was posted in Multiple Cloud Layers, New England on April 7, 2017 by Scott Lindstrom. The brightness temperature difference field (10.7 µm – 3.9 µm), above, over New England during the morning of 11 December 2015 shows extensive cirrus cloud cover (a hole in the high clouds moves over Southern New England just before sunrise). 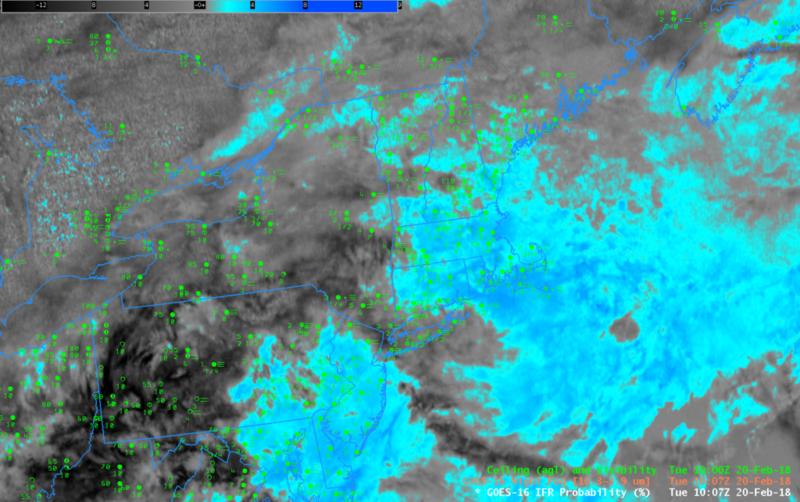 Surface observations of ceilings and visibility show widespread IFR conditions, yet cirrus and mid-level clouds prevent a diagnosis of the low clouds. GOES-R IFR Probability fields for the same times, below, do show a strong signal (that is, higher probability of IFR conditions) in regions where IFR conditions are observed or where they have recently developed. 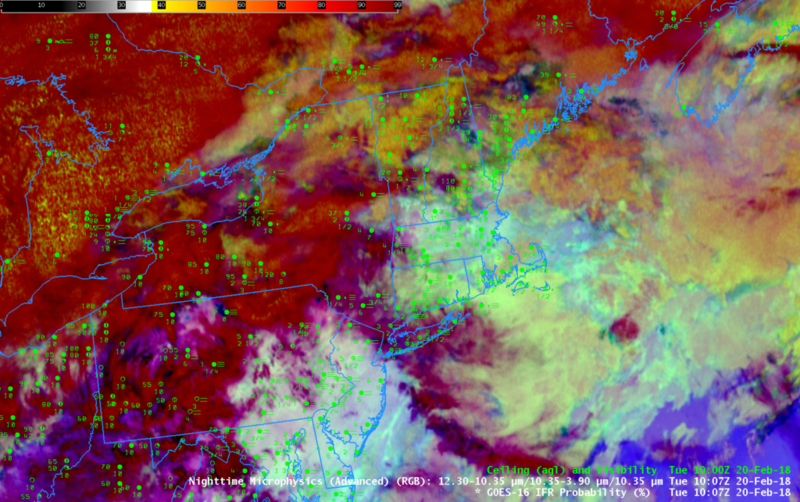 Because GOES-R IFR Probability fields incorporate information from the Rapid Refresh about low-level saturation. 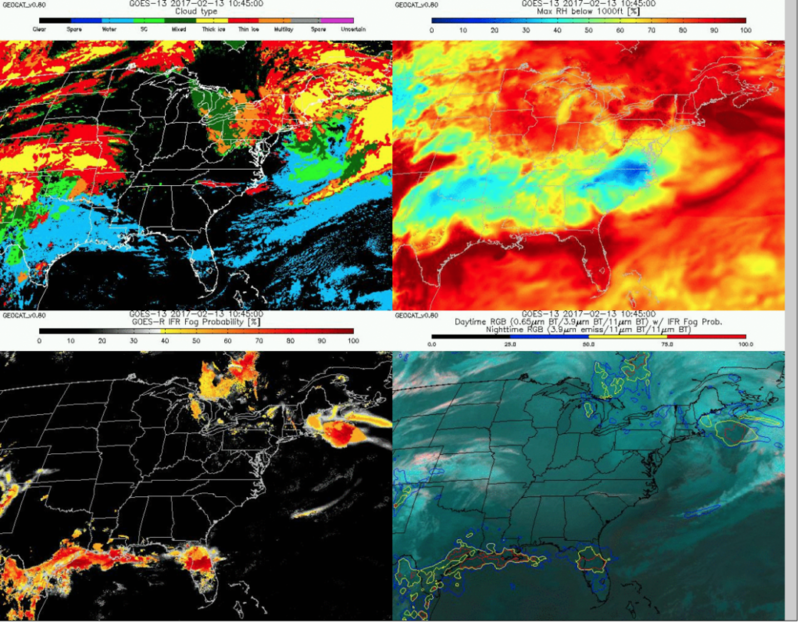 Even if clouds decks obscure the view of near-surface clouds, as in this case, GOES-R IFR Probability fields, because they fuse together satellite data and surface information from the Rapid Refresh model, can provide useful information. This entry was posted in Multiple Cloud Layers, New England on December 11, 2015 by Scott Lindstrom.